How well do you know George Washington — the first ever president of the United States? Are you well versed in George Washington quotes? George Washington was called “father of his country” during his lifetime. He was Commander-in-Chief of the Continental Army during the American Revolutionary War and was one of the founding fathers. Unanimously elected in two elections, Washington was admired for his strong leadership and able administration. Choosing the humble title “Mr. President” over other more grandiose names, he was very careful in attending to his duties and responsibilities as President. He was aware that as the first president of the US, he was setting a big precedent for other presidents to follow. Declining a third election which he would otherwise would have won, he addressed the American People in his farewell address and bade them to cherish the Union, avoid partisanship, and to cement foreign alliances. A man of deep integrity, personal values, and patriotism, he was widely mourned for upon his passing. Know more about the first president of the United States with these handpicked George Washington quotes. 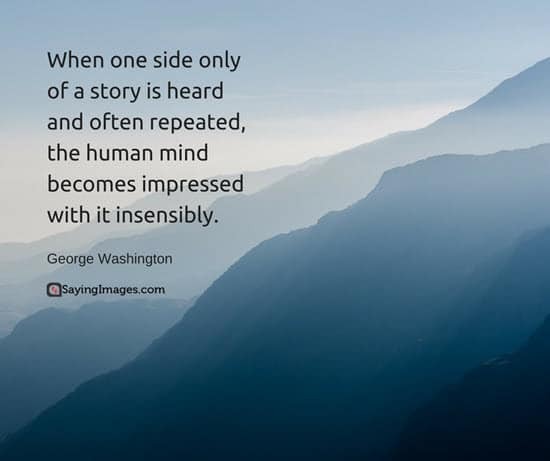 Share your favorite George Washington quotes with your family and friends.